Sinclair Cleaning Systems offers a full service department for all your repair and general maintenance needs! Let's face it, "Time is Money". You can't afford down time, especially in the busy season. Trust in the peace of mind that Sinclair Cleaning's Service Department offers by scheduling regular maintenance appointments. Drop-ins are welcome; however it is always best to call ahead and schedule your appointment. Same day repair options are available (schedule permitting). 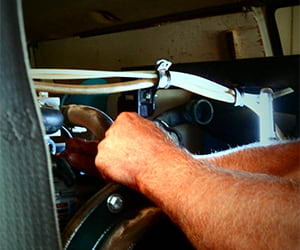 Both locations are staffed by certified truckmount technicians, ready to serve you. Standard fees are $80/hr for labour, plus the cost of any parts. We refurbish used truckmounts for resale. To sell your used truckmounts, portables and drying equipment on consignment through Sinclair Cleaning Systems, please call toll-free at: 1.800.265.0505. We stock a wide variety of parts and order direct from the manufacturer. Trust your cleaning systems to the seller. It'll be done right.